My interest in technology was encouraged by my tech teacher and by my friends who are also involved in robotics and technology oriented classes. But what really inspired me to become involved in technology is Star Trek. The technology in the movies and series is really cool. I wanted, and still want, to make it a reality. 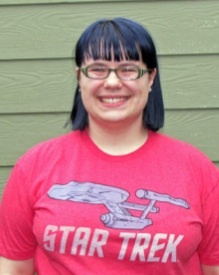 Not only did Star Trek spark my interest but it helped me meet people who shape my life today. I am proud of how quickly I learned RobotC. With only a little mentoring I was able to program our robot well, and easily change the code my mentor gave me. I enjoy that technology allows people to stay connected and learn about things that their social circumstances would usually stop them from learning . Future: I plan to get a degree in Mechanical or Electrical Engineering, and after that get a degree in Aerospace Engineering. I hope to work for NASA or a similar program. Interesting fact: In 8th grade I memorized There Will Come Soft Rains by Sara Teasdale. I liked the meaning behind it.